Diagnostics excellence. For 30 years. 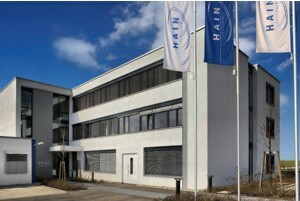 Hain Lifescience GmbH is a manufacturer and distributor of in-vitro diagnostics based in Nehren in the district of Tübingen. Our customers are medical laboratories worldwide. We are specialists in molecular genetic test systems and technical instruments for the detection of dangerous pathogens or hereditary diseases.The company was originally founded by David and Tobias Hain in 1986 as a mail order company offering laboratory supplies.Over the last 30 years the company developed steadily and successfully.Our overriding goal is to provide our customers in Germany and everywhere in the world with the best possible support. That’s why we established subsidiaries in Spain, the United Kingdom, France, South Africa and Kenya. In most of the remaining countries of the world, we are represented by long-standing partners. Thus, our diagnostics are available in more than 75 countries and offer optimal solutions for the laboratory routine. More than 100 employees are working at the headquarters in Nehren. Half of our employees are scientists and principally involved in research and development, production, quality management and quality control. Hain Lifescience is ISO 9001 and ISO 13485 certified, our products fulfill the European in-vitro diagnostic guidelines (98/79/EG). A validated and efficient diagnosis is the best prerequisite for the rapid and reliable detection of a disease. Modern, comprehensive and secure diagnostics enable an effective treatment specifically adapted to the individual patient. This provides the greatest chance of healing. Only user-friendly and practical diagnostic methods can be performed accurately and reliably in the laboratory and thus guarantee dependable results. Our products fulfill all of these criteria and consequently allow for an optimal laboratory diagnostics. We offer everything which is needed for modern and user-friendly diagnostics: From swabs, nucleic acid isolation, all the way to molecular genetic assays and technical devices. Our diagnostics are suitable for laboratories of any size with small, medium or large sample throughput. The test procedure can be performed manually with common laboratory devices or even automated. Here, different levels of automation are possible depending on the number of samples. For this purpose various technical instruments are available. They can be flexibly adapted according to individual requirements and combined into a system. When developing new or modifying existing products, we work closely together with collaboration partners all over the world. That’s why we are able to identify our customer’s needs at an early stage and incorporate them in our products. We aim to find the perfect solution for every customer and laboratory. Our products will enable laboratories worldwide to perform reliable and sound diagnostics in order to cure patients and avoid the spread of drug resistances and infections.